That's What She Fed: Daring Cooks December Challenge: Poach to Perfection! Daring Cooks December Challenge: Poach to Perfection! Jenn and Jill have challenged The Daring Cooks to learn to perfect the technique of poaching an egg. They chose Eggs Benedict recipe from Alton Brown, Oeufs en Meurette from Cooking with Wine by Anne Willan, and Homemade Sundried Tomato and Pine Nut Seitan Sausages (poached) courtesy of Trudy of Veggie num num. Mandatory Items: To use the technique of poaching an egg (or vegan substitute). At every brunch, I find myself ordering crab benedict if it is on the menu. When challenged to use the poaching technique, it seemed like the perfect excuse to cook my favorite egg dish at home. My friend Rosie is an expert at poaching eggs and thankfully walked me through the process. Poaching eggs isn't as difficult as expected, and I'm excited to start using the technique in more dishes. We had some timing issues with our meal, so I've laid out the directions in the order I wish I had followed them. 1. Prepare the Maryland crab cakes. Inspect the crab meat for any cartilage and set it aside. Crush the saltine crackers very fine and mix with all the other ingredients. Gently fold in the crab. Shape into 8 crab cakes, and refrigerate for at least 1 hour. 2. Poach the eggs. Bring a pot of water to a boil and add salt and a splash of vinegar (any kind will do). Start swirling the water in a circle with a spoon. Once you have the water swirling in one direction, crack the eggs directly into the water (I did this one egg at a time). Swirl the water around the egg with your spoon to keep it together. Cook for 3 minutes for a a runny yolk. Set eggs aside. 3. Make the hollandaise sauce. Fill a medium saucepan halfway with water and bring to a simmer. Cut the chilled butter into small pieces and set aside. Whisk egg yolks and 1 teaspoon water in a mixing bowl large enough to sit on the saucepan without touching the water (or in top portion of a double boiler). Whisk for 1–2 minutes, until egg yolks lighten. Add the sugar and whisk 30 seconds more. Place bowl on saucepan over simmering water and whisk steadily 3–5 minutes (it only took about 3 for me) until the yolks thicken to coat the back of a spoon. Remove from heat (but let the water continue to simmer) and whisk in the butter, 1 piece at a time. Move the bowl to the pan again as needed to melt the butter, making sure to whisk constantly. Once all the butter is incorporated, remove from heat and whisk in the salt, lemon juice, and cayenne pepper (if using). Keep the hollandaise warm while you cook your crab cakes in a thermos, carafe, or bowl that you’ve preheated with warm water. 4. Cook the crab cakes. Heat about 2 tablespoons of vegetable oil in a non-stick frying pan. Sauté until golden brown on each side. This will only take about 3-5 minutes per side. Toast your English muffins while cooking the crab cakes. 5. Put it all together. 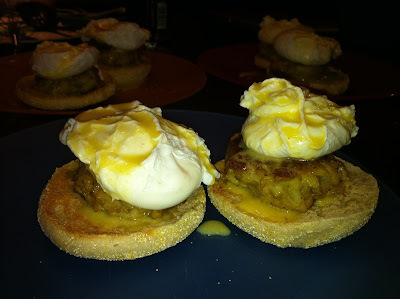 On each English muffin, layer a crab cake and poached egg, topped with hollandaise and chives for garnish.